(WASHINGTON, DC) – The Alcoholic Beverage Regulation Administration (ABRA), a District of Columbia government regulatory agency in charge of the issuance, regulation, compliance and enforcement of liquor licenses and laws throughout the nation’s capital, on Monday, November 5, received the 2018 National Liquor Law Enforcement (NLLEA) Agency of the Year Award. NLLEA, a non-profit association of law enforcement personnel dedicated to the enforcement of liquor laws and regulations, presented awards recognizing innovation and excellence for alcohol law enforcement on Monday, in Seattle, at NLLEA’s annual conference, Alcohol Law Enforcement: Managing Public Safety in the Changing Tides of the Alcohol Environment. The conference will focus on the ways the alcohol enforcement profession is changing and what agencies must do to meet new expectations. ABRA previously received NLLEA’s “Innovative Alcohol Law Enforcement Program of the Year,” in 2017, recognizing ABRA’s DC: Double Check 101 program and in 2009, recognizing the programs implemented for the 56th presidential inauguration. ABRA’s mission to support the public’s health, safety and welfare through the control and regulation of the sale and distribution of alcoholic beverages was greatly enhanced due to various new and improved programs, initiatives and procedures. ABRA continues to achieve its mission and improve the quality of health, safety, commerce and community in the District of Columbia. New Year’s Eve is just around the corner. Restaurants, bars and other on-premises establishments that want to host New Year’s Eve events until 4 a.m. on the next morning but have not yet signed up for the Extended Holiday Hours Program will need to register by Dec. 1 to participate. Any licensee registered for the program during 2017 will be automatically eligible to participate in the program during 2018. A list of registered establishments as of this Thanksgiving is available on Alcoholic Beverage Regulation Administration’s (ABRA) website. Next year, licensees enrolled in the program will be able to stay open later during 11 District and Federal holidays, which includes three separate three-day holiday weekends. The complete 2018 calendar can be reviewed on ABRA’s website. Licensees that have questions can contact ABRA’s Licensing Division by emailing or calling (202) 442-4423. New or renovated full-service grocery stores could soon be selling beer and wine in Ward 4 under proposed legislation that unanimously passed its first reading before the District of Columbia Council on Nov. 7. Under current law, new alcohol licenses cannot be issued to liquor stores or beer and wine stores in the area, with one exception. New or renovated full-service grocery stores—which are required to meet a host of criteria—that are located within Advisory Neighborhood Commission 4C07 can obtain a license to sell beer and wine, so long as the store does not devote more than 3,000 square feet of space to alcoholic beverage sales. The proposed bill would expand the exemption to include any full-service grocery store located in Ward 4 for the issuance of a class B off-premises retailer’s license. The measure would also eliminate any restrictions on the amount of space a Ward 4 grocery store can dedicate to alcoholic beverage sales. In addition, the proposal would allow new or renovated grocery stores in Ward 4 to sell growlers of beer and wine. The stores would still be prohibited from selling single containers of beer, malt liquor or ale in sizes of 70 ounces or less. In 1994, the Colorado state legislature adopted a measure that required the state’s Department of Motor Vehicles to issue vertically formatted driver’s licenses and ID cards to anyone under 21 years old in order to combat underage drinking. Fast forward to 2017 when more than two-thirds of states across the country have since followed suit, including the District of Columbia. The vertical design was intended to help document checkers at bars, restaurants and other age-restricted venues to more easily identify minors by distinguishing their IDs from conventional horizontal layouts. All vertical driver’s licenses and ID cards issued by U.S. states and jurisdictions indicate that the document was issued to a minor. However, a vertical ID doesn’t necessarily mean that the person presenting it is, in fact, still under 21 years of age. Many states issue vertical licenses for terms longer than a minor’s 21st birthday. In some jurisdictions, a vertical license marked “under 21” may be valid for years after the holder’s 21st birthday. Licensees and their staff are encouraged to give the same extra scrutiny to checking vertical IDs as their horizontal counterparts. After verifying the birthdate, it is also important to check the expiration date to verify whether the ID is still valid. In addition, examine the presenter and compare him or her against the image in the document and review the biographic information to determine if there are any significant discrepancies. Although a vertical license may still be valid, genuine under 21 documents are often passed on to other minors when the original ID holder turns 21 and applies for a new license. New ways of doing business could be on the horizon for District alcohol licensees if a proposed bill introduced by Mayor Muriel Bowser is passed. The legislation—titled The Omnibus Alcoholic Beverage Regulation Amendment Act of 2017—would need the approval of the District of Columbia Council and the Mayor’s signature in addition to undergoing a 30-day Congressional review period before becoming effective. Under the proposal, a number of businesses would be able to extend hours for the 2018 MLB All-Star Game and FIFA World Cup events taking place next year. The city will be center stage when the District of Columbia hosts the All-Star Game for the first time in decades. Under the legislation, on-premises retailers, manufacturers and temporary license holders would be able to sell and serve alcohol until 4 a.m. and operate 24 hours a day from July 14-18, 2018. In addition, patrons would be able to watch live soccer games as they occur overseas for the World Cup events at registered restaurants, taverns, hotels and other on-premises establishments beginning at 7 a.m. throughout the month of matches. World Cup events are scheduled to run from June 14, 2018 through July 15, 2018. Another provision of the bill would address concerns heard from businesses as well as parents running errands with babies and children. Under current law, anyone under the age of 18 is prohibited from entering liquor stores during school hours. The bill proposes allowing children and others under 18 to enter liquor stores with a parent or guardian present. Other items in the bill would expand how licensees can provide their products to customers. Similar to a law enacted last year that allowed grocery stores to sell growlers of beer, wine, cider and mead, the proposed bill would permit beer and wine stores (class B off-premises retailers) to do the same. The bill would also expand doggy bag and gift bag permissions beyond restaurants. The legislation proposes allowing hotels to reseal a bottle of wine for a customer, which they can then take home with them in a doggy bag. The bag would need to have a dated receipt attached to it and must be closed in a manner that would make it easy to notice if the container were opened or tampered with. The proposed bill would also permanently exempt taverns, multipurpose facilities, liquor stores and beer and wine stores located in the Southwest Waterfront from the 400-foot licensing restriction from schools and other facilities. The same measure had been approved this year on an emergency and temporary basis. Without such an exemption, alcohol licenses are prohibited from being issued in the Southwest Waterfront development because these establishments would be located within 400 feet of two school facilities. Among the proposed enforcement measures in the bill, liquor stores, grocery stores and other off-premises retailers with security cameras would be required to provide footage to Alcoholic Beverage Regulation Administration (ABRA) investigators or Metropolitan Police Department officers upon request. Another item would require an applicant for a liquor license to take pictures of posted placards and to provide copies of the pictures to the Alcoholic Beverage Control Board upon request. In addition, there would be changes to how the penalties for sale-to-minor violations and ID-check failures are determined. The complete bill can be reviewed online. Stay tuned for updates on the legislation in ABRA’s Last Call newsletter. 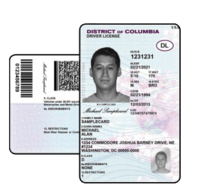 District alcohol-licensed retailers are required to obtain a permit in order to import and transport alcoholic beverages into the District of Columbia. 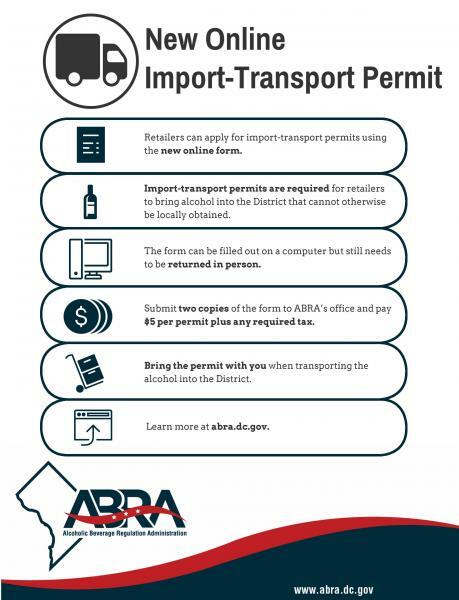 An import-transport permit may only be issued to a retailer for alcoholic beverages that cannot be obtained in sufficient quantity from any licensed manufacturer or wholesaler in the District of Columbia. Pay a $5 fee for each import-transport permit in addition to any necessary gallonage tax. Forms may be submitted at ABRA’s office between 8:30 am-4 pm, Monday-Friday. Payment can be made in the form of a cashier’s check, certified check, business check, attorney’s check, personal check, or money order. A check or money order must be payable to the DC Treasurer. Payment may also be made by Visa or MasterCard. The import-transport permit must accompany the shipment of alcoholic beverages.